Technology isn’t only evil because it’s in the hands of the warmongering, Earth-destroying state, but because of its origins. You find out very quickly that this technology isn’t only evil because it’s in the hands of the warmongering, Earth-destroying state, but because of its origins. The Empire, which basically controls the world, has been capturing Espers — nonhuman creatures with the power of magic — and locking them away in a research facility where their magic is extracted for the Empire’s technological gain. Nonhumans trapped in research facilities against their will, being tortured and killed for the benefit and power of a few elite humans, while the general public is blissfully unaware of the government’s true motives. Sound familiar? 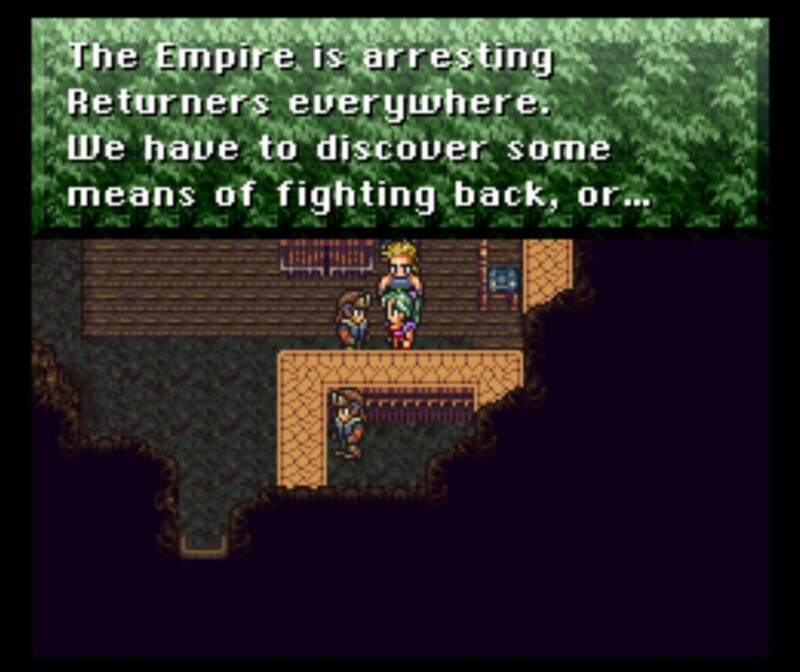 You begin the game as a half-human, half-Esper aptly named Terra (Latin for “Earth”). As soon as Terra is introduced there are hints of radical historical analysis in regards to the destruction of the Earth and the oppression of both women and Earth-centered cultures. Terra is considered a danger to the Empire, as she is known to have the power of magic, and thus is considered a “witch.” There is a search to eliminate her — a literal witch hunt — by the Empire that is playing with the technology that destroyed much of the Earth 1,000 years before. 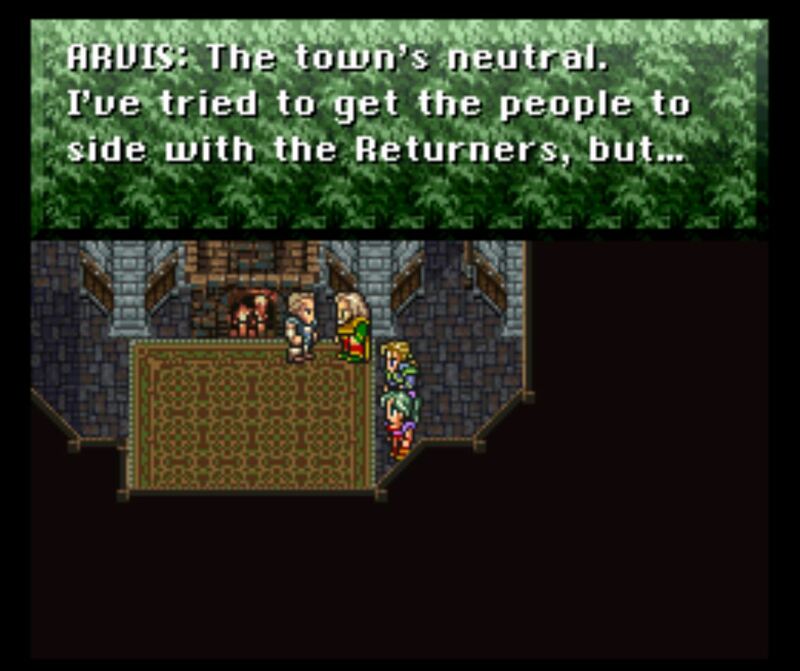 Eventually you (as Terra) escape and join an “underground resistance movement” called the Returners. The Returners are a ragtag collection of individuals who each have their own motives for fighting the Empire. Your team eventually consists of a treasure hunter (or thief, depending on your perspective) who vows to destroy the Empire after his friend is imprisoned; a King, and his brother who “traded the throne for freedom”; a wandering assassin with a loving dog; a feral child who grew up in the wilderness and can learn the techniques of any animal; a genetically engineered Imperial General who defects from the Empire; a world-famous gambler; a yeti; and many others. 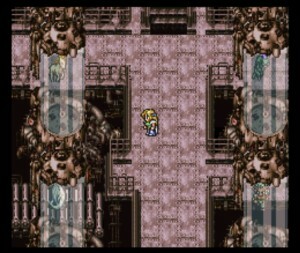 Celes, the genetically engineered Imperial traitor, gazes at the Espers imprisoned in the Magitek Research Facility. The game mostly involves traveling the world trying to take down the Empire, while gaining new members to strengthen your resistance movement. You eventually decide to engage in some direct action, breaking into the Magitek Research Facility where the Espers are imprisoned. Though you try to save them — and drop some economic sabotage on the place while you’re at it — the Espers decide that your movement is more important than their individual lives, and they sacrifice themselves to give you their powers. 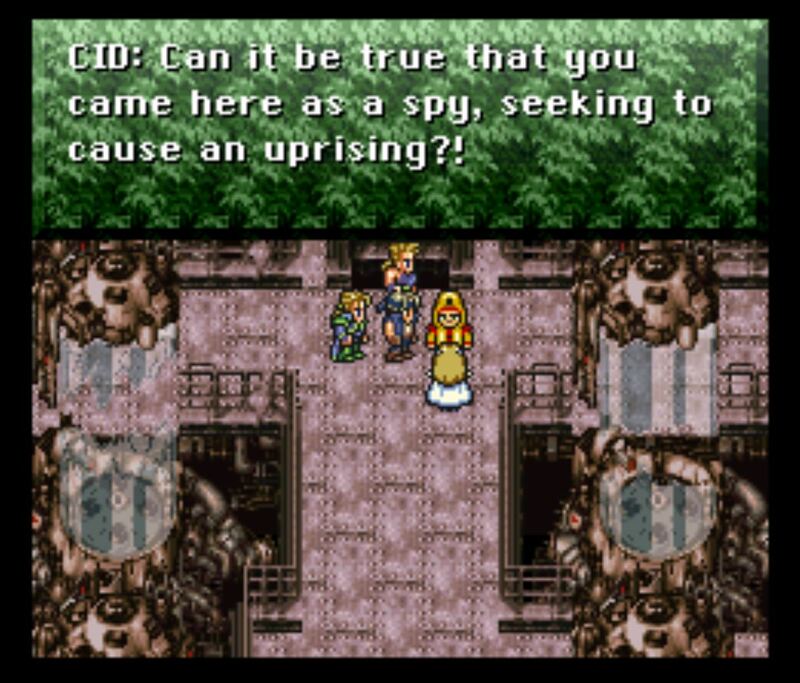 Celes’s true motives are discovered by the Empire, but not before the research facility is wrecked. Unlike most games where you and a group of fighters try to save the world from seemingly all-powerful enemies, this game doesn’t quite let you do it — at least not right away. 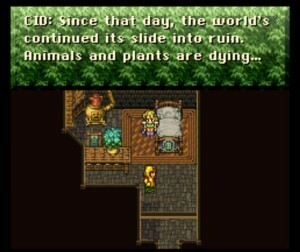 Instead, the game takes place in two main phases, basically pre- and post-collapse. You begin the game in the World of Balance — lushly green, but heading towards collapse. Your journey to stop the Empire has an impact, but not enough to end its evil plans. Your efforts are stopped by Kefka, an Imperial General and the true antagonist of the game. 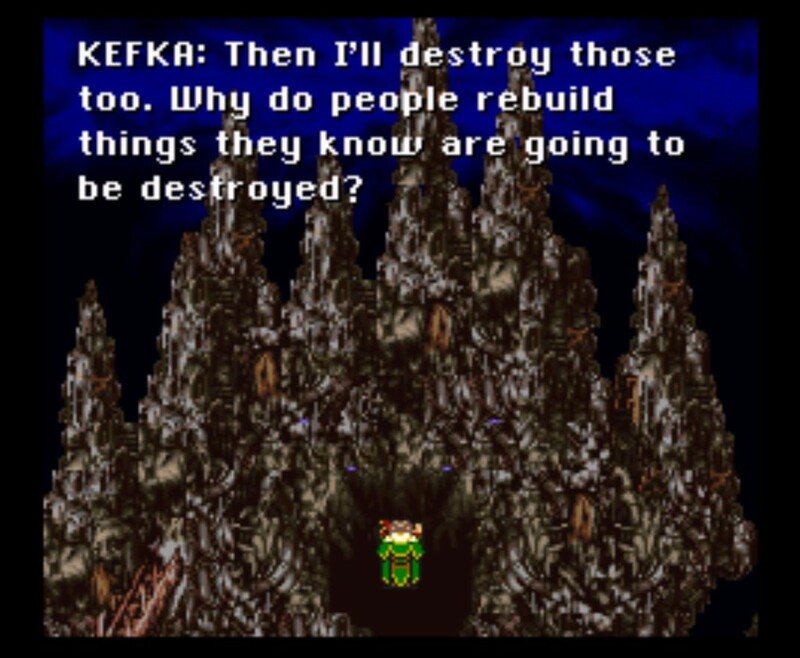 Kefka is the first human genetically engineered to have magical powers, but the manipulation of his natural state warped his mind, turning him into a nihilistic villain bent on the destruction of basically everything. Kefka is almost comically evil, but his over-the-top hatred for all things good and pure is a simple yet apt metaphor for industrial civilization — a good way to get the message across in a 16-bit video game. 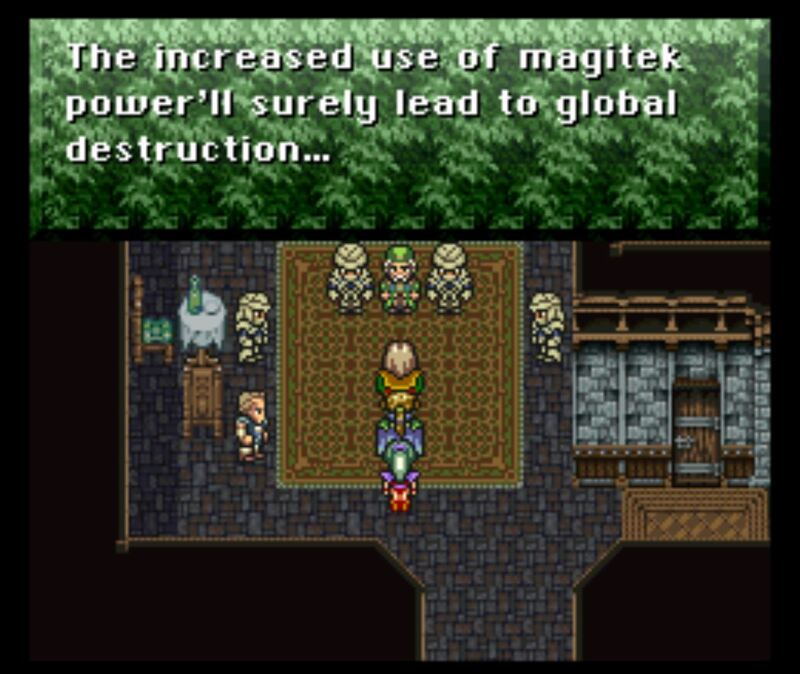 Despite the efforts of the Returners, Kefka is able to increase the power of Magitek technology, collapsing civilization as we know it and turning the World of Balance into the World of Ruin — a scorched, post-apocalyptic landscape where most cities are in ruins and the Empire’s troops have reign over nearly every corner of society. You awaken in the World of Ruin as Celes, the genetically engineered Imperial traitor, one year after the collapse. 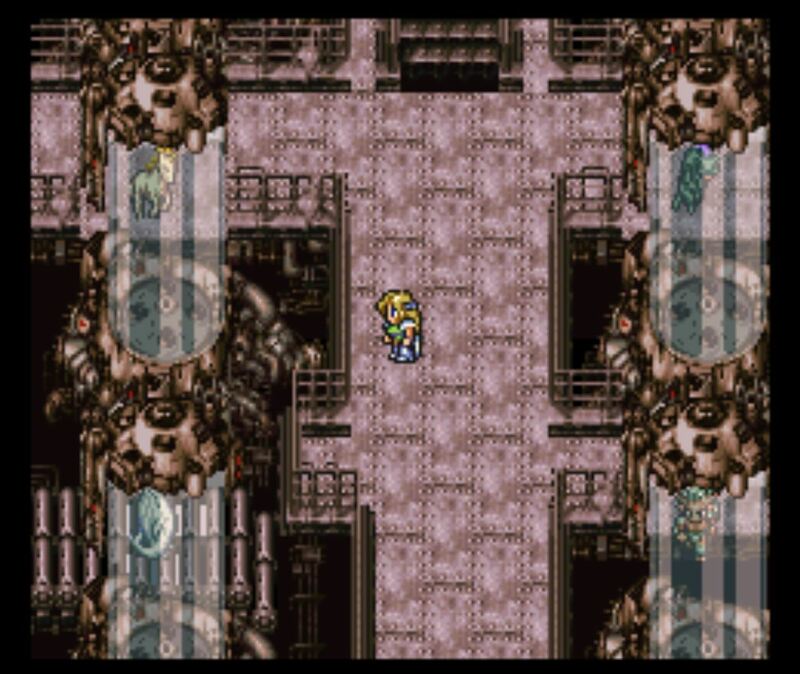 You want to face Kefka, to end the reign of the Empire, but first you must find your cohorts to ensure you have a party strong enough to get the job done. For anyone who has daydreamed about industrial collapse, this is an important lesson. Once civ ends, there will still be work to be done (and possibly more civ to end). How is your affinity group going to stay in contact? What are you strengths, what are your weaknesses, and how can you all work together to shut down Imperialism once and for all, and free as much earth as possible? 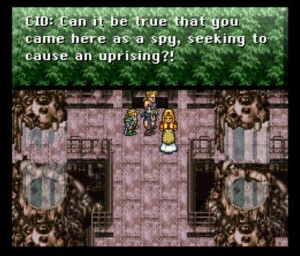 Of course, FFVI‘s story isn’t without its problematic elements. It is peculiar that a group fighting to save the planet from destruction, and concerned about dying plants and animals, kills every single animal it encounters in the wild, from dragons to stray cats to little bunnies sitting on cabbages. And, like most games of the era, FFVI is very gendered. The males are the fighters, while the two main female characters are initially the ones the group relies upon for healing. These two characters also have to deal with being hit on by men constantly, and one of them is even captured by a confused, love-struck man. Terra’s spiritual journey also has some very gender role-oriented characteristics, including finally finding her place in the world by becoming a mother. 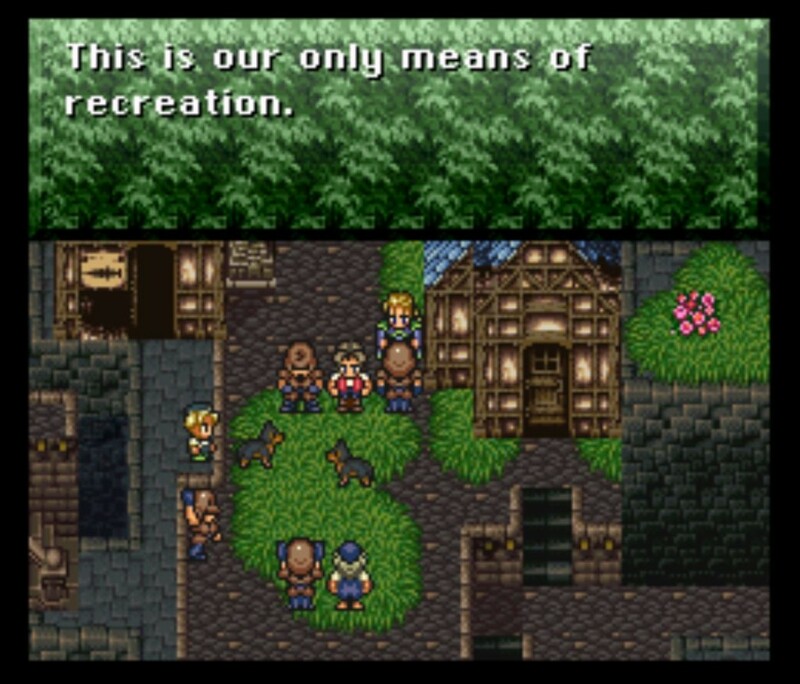 That being said, the game feels more progressive than most games of the time, placing two strong, revolutionary females in the principle roles, and poking its radical head out to question mainstream ideas like the notion of human progress, the treatment of the natural world, and even gender roles at times — as when Cyan, the burly male swordsman, gets offended because a girl hits on him in a bar. 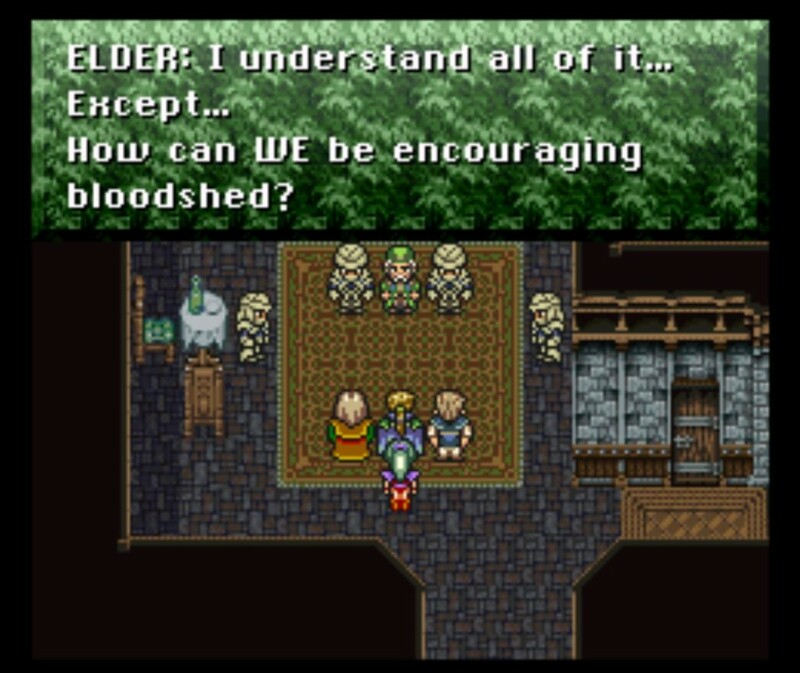 These moments don’t overshadow some of the political issues the game has, but they do make it more complex and progressive than others of its generation. 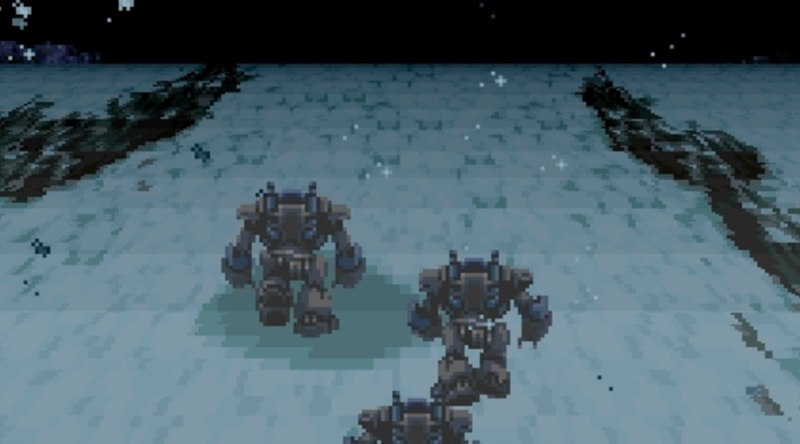 FFVI is an epic game, taking me over 30 hours to complete in my second playthrough, but the exhilarating battles and story should keep you invested until the final showdown with Kefka — the battle of hope versus nihilism. 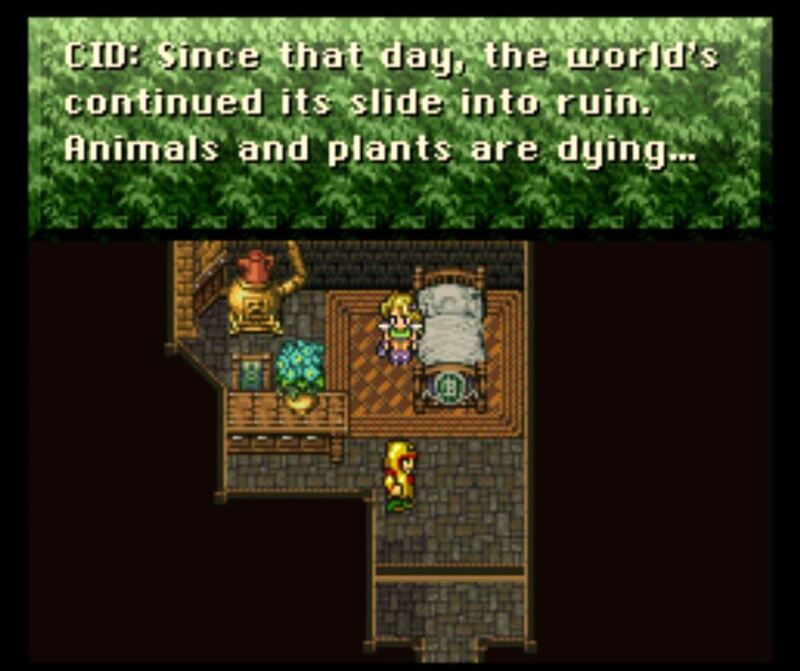 As a cynical environmental activist, I was delighted to find myself buying into Terra’s arguments for protecting life, rather than Kefka’s arguments for destroying it all. And after 30 hours of gameplay, it felt like inspiration I had actually earned. 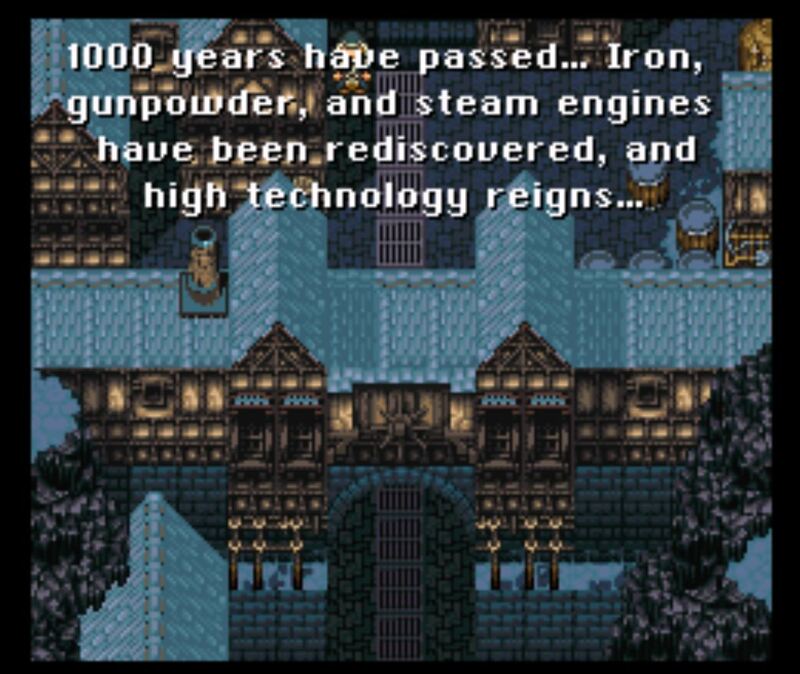 With excellent gameplay, a complex story, revolutionary elements, and some anti-civ sentiments (I acknowledge the hypocrisy of admiring that in a video game…), FFVI is a must-play for green anarchist video game nerds everywhere. Now, hopefully there are a few of you out there.